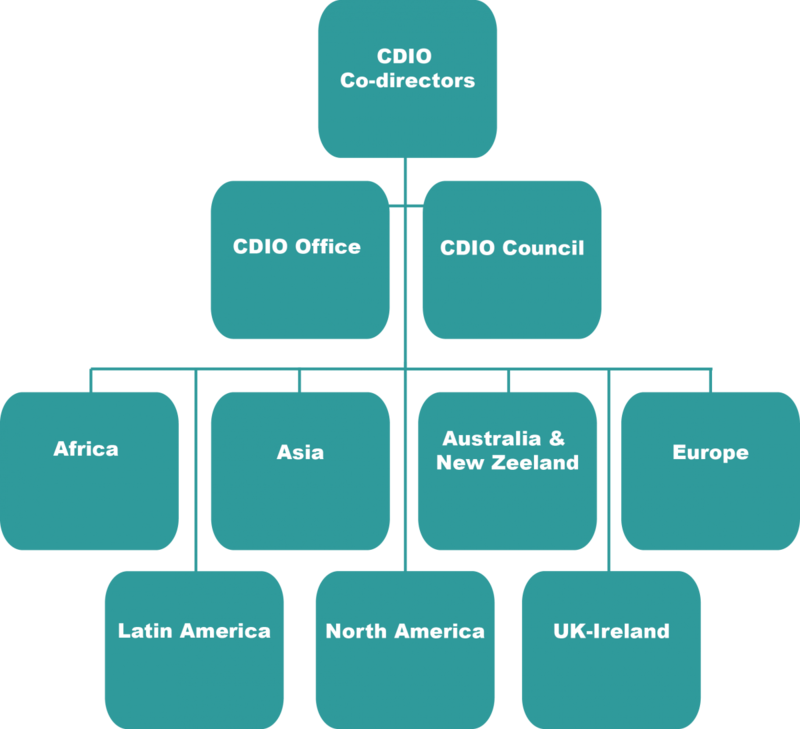 The CDIO Initiative consists of more than 120 schools around the world organized into 7 regions; Europe, North America, Asia, UK-Ireland, Latin America, Australia, New Zealand and Africa. These are led by one or several regional leaders appointed by each region. The CDIO Initiative is supervised by the CDIO Council formed by the regional leaders, 6 Members-at-Large and 2 Co-directors. The Co-directors are elected for 2 years and election of 1 is held yearly. The Members-at-Large are elected for 3 years and elections of 2 are held yearly. All elections are arranged at the Annual International CDIO Conference and the participating schools have one vote each. The regional leaders may be more than one per region alternating with each other, however the region only have one vote in the Council. The CDIO Initiative organizes the annual International CDIO Conference in June and a Fall meeting each year. All regions also have 1-2 regional meetings yearly to present work and studies within Engineering Education, elect regional leaders and listen to presentations from new schools joining the Initiative. The CDIO leaders, all school representatives, meet every other month in a teleconference to discuss and manage the Initiative’s different activities. Schools that are interested to join the CDIO Initiative are recommended to participate in Conferences and Fall meetings to learn more about the Initiative and the CDIO vision of education, before filling in an application and a self-evaluation. The application is reviewed by the CDIO council and then, if approved, the school is welcome to join in the appropriate region and present at next regional meeting.